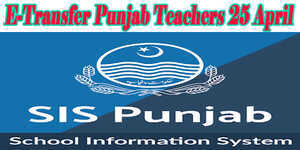 No.SO (Cab-ll)/1-2/2018 has issued a notification by the government of the Punjab services & general administration department (cabinet wing) Dated Lahore. The 26"' September. 2018 regarding The Open Door Policy 2018 during Office Hours Government Punjab. 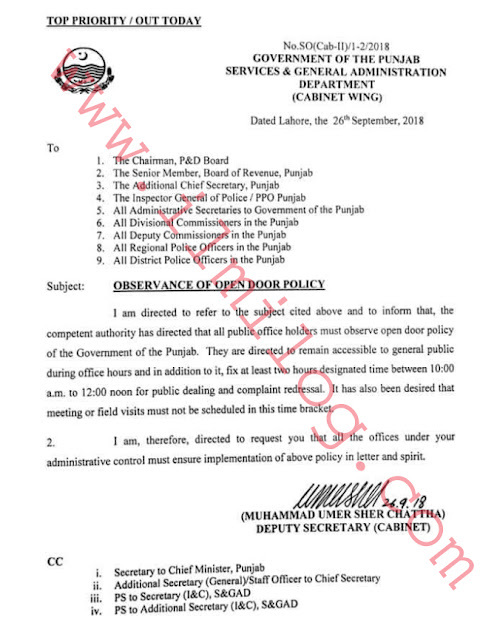 It is directed to refer to the subject cited above and to inform that, the competent authority has directed that all public office hours must observe open door policy of as Government of Punjab. They are directed to remain accessible to the general public during office hours and in addition to it, fix at least two hours designated time between 10:00 a.m. to 12:00 noon for public dealing and complaint redressal. It has also been desired that meeting or field visits must not be scheduled A this time bracket. 2. I am, therefore, directed to request you that all the offices under your administrative control must ensure implementation of above policy in letter and spirit.